Disability Blog Carnival #40 is up NOW! 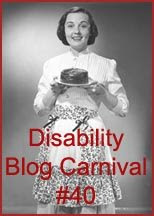 The latest Disability Blog Carnival edition at Pipecleaner Dreams is literally sweet--it includes a recipe for coconut cake! And a lot of links to bloggers writing about celebrations, too, of course -- from pizza with Dave Hingsburger to bridal shopping with Kara Sheridan (and doesn't that sound like a fun-filled day already?). Next edition is due July 10 at Retired Waif. The theme set by RW (who also hosted #18) is "death/spirituality/end-of-life issues." Submit links for consideration through the usual channels--in comments here or there, via the blogcarnival.com form, or by putting "disability blog carnival" in the text of the post you want me to find (that usually works). Vertical Campus, originally uploaded by Edu-Tourist. Several contributors to DS,TU were in New York meeting last week for the annual meeting of the Society for Disability Studies (June 18 - 21). It was, as always, a very diverse conference, incorporating a significant discussion of arts and cultural topics, writing workshops, poetry and performance, and community events. With such a diversity of offerings, one can fairly say that each participant 'cripped' the city in her own way. 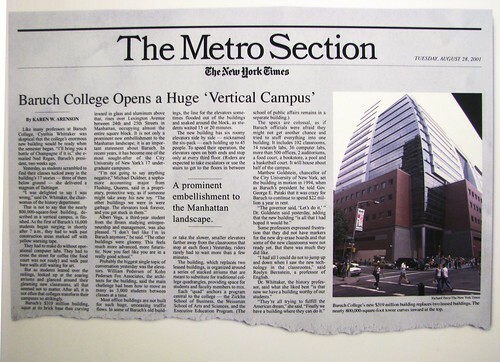 At the center of it all was the beautiful new conference center at the heart of the Baruch College campus. The conference organizers went above and beyond to ensure that the conference was an enjoyable experience. 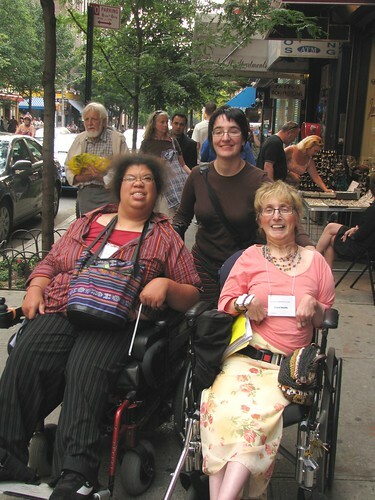 Conference sessions are now a model of accessibility, facilitating participation by all. Long breaks between sessions allowed conversations to continue in the hallways, and accommodated different physical needs and attention spans. Even the attentiveness to audio description was exemplary. But again, everyone's SDS is a little bit different, so I invite you to share your experiences. "Cripping" Greenwich Village, originally uploaded by Edu-Tourist. One of our favorite spots was Greenwich Village. Thursday evening we headed down to New York University the caberet hosted by Mat Fraser: OUTSIDE THE BOX/PERFORMING DISABILITY: An Evening of Cabaret, Dance and Drama. Brief clip from the evening. It was a wonderful evening - the weather was delightful - Carol has always considered herself something of a Bohemian. I hear that she went back Saturday morning for some more shopping. What was your favorite SDS Conference moment? "Reflections On the Physical and Moral Condition of the Blind (1825)"
from Reflections: Writings of a Young Blind Woman in Post-Revolutionary France (NYU Press 2001). This brief yet surprisingly expansive treatise on blindness was probably dictated in desperation to one or more sighted scribes in the early nineteenth-Century French equivalent of a renter's résumé, only to be rejected, set aside, and lost for almost two-hundred years. The blind author's first-hand observations about blind people and their social status, rules for marriage, prospects for romance, and appropriate pedagogical approaches paint a portrait of a bygone place and time with hauntingly familiar themes which remain with us to this day. The style is 100% over-the-top, unedited nineteenth century, translated French hyperbole, with all of the linguistic curlicues and semantic serifs one could possibly wish for. Blind women are referred to as "female companions of misfortune," and chapters have titles such as "On the Inflection of a Sweet Voice on the Heart and Senses of a Blind Person." Nevertheless, an amazing amount of what she has to say strikes strong resonant chords in today's blind world. Even when her observations seem antique or deliberately demure, her writing raises deep questions as to why her experience was what it was, and why ours is what it is (or isn't). We welcome Carrie Paff - a treasure of stage and screen - who will read for us, and Professor Catherine J. Kudlick - the manuscript's re-discoverer and translator - who will help us to place Adele Husson in her proper historical context. Society and broader Bay Area blind community. Society. We hope you will attend. This isn't brand new (it was on the festival circuit in 2007, and first televised in January 2008), but I just learned of it (at the Berks, thanks Susan). And Jana has requested "things to make me laugh," so here's "Coming Out," an award-winning short film from BBC2's See Hear, written by Charlie Swinbourne and directed by Louis Neethling. David Hay and Debbie Norman are playing the son and mother. All right dear, just a minute. It's about me. Who I am. The thing is that I...I'm different to other people. Oh, I know that, you're my special boy! Always have been. No, I mean really different. I've know for sometime now, but... I'm deaf. Charlie Swinbourne's "Four Deaf Yorkshiremen" is also on YouTube. (This one has no audio at all, all subtitles.) Fookem and Bug has an interview with Swinbourne. Disability Studies scholars need to do better in educating the public about outstanding Disability Studies scholars and activists who are responsible for major social change, not only change for people with disabilities, but change for the betterment of society in general. Within the past six weeks, two luminaries who made incredible contributions to the understanding of human behavior and the variables of repression which undermine human diversity died. Harlan Hahn and Hariet McBride Johnson were two extraodinary scholars and activists who recently passed away. Hahn, a recognized professor of Political Science at the University of Southern California wrote prolifically on the underpinnings of social dominance, deconstructing the causes of oppression and descrimination. He revealed the ways in which economics, politics, and social policy are influenced by principles of privilege to create inequality and disadvantage. Hariet McBride Johnson, a lawyer that could match wits with any Clarence Darrow, was not only an activist for Disability Rights but for Human Rights in general. While in college, she actively participated in many social causes including the fight for fair and equitable trade practices in underdeveloped countries. The most memorable accomplishment of Johnson, for many of us, was her assuming the responsibility of single-handedly debating Princeton's Chair of the Ethics department. Jonhson and Peter Singer debated the issue of whether or not it was socially responsible and rational to extend extraordinary medical means to save the lives of severely disabled newborns. Johnson, though physically contracted by a neuro-muscular condition, delivered her arguments in as straight and eloquent a fashion as any great orator of past and present. With reserve, integrity, and passion, she expounded the rationales upholding the values of human life. One may say that these two individuals would only be of interest and concern to disabled people, but I would argue that the work they have painstakingly achieved in their lives in terms of expanding social intellect ,which translates into policy that affects people's everyday life, may very well touch each of us, disabled or not, in positive and unexpected ways. Disability Blog Carnival #39 is up NOW! Emma at The Writings of a Wheelchair Princess has an excellent edition posted Thursday on the theme, "If I knew then..." So there are posts about regret, but there are also posts about learning things are really okay, when that wasn't always clear. Got a time machine? I'd love to be able to tell the me of twelve years ago that before too long, I'd have email and websites and listservs and eventually blogs and feeds and carnivals, and that the isolation of new motherhood circa 1995 was about to be dispelled. The next carnival (#40!!!) is scheduled to post on Thursday, June 26, at Pipecleaner Dreams. Watch there for the theme, and get your entries in via the usual channels by the end of Monday, June 23, to let the host have her best chance to assemble a great edition. This is for Kay Olson at Gimp Parade... and for Lene Andersen at the Seated View, too. 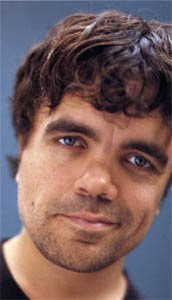 American actor Peter Dinklage is turning 39 today. "I don't like people being cautious and tentative and choosing their words carefully around me because I'm a dwarf. There are a lot of people in a lot worse shape than me. I'm 4'5" and it's part of who I am, just not the whole part. I guess the word to call me is my name, Pete." Well then, Happy Birthday, Pete! Outside of my office window I have seen lines of young graduates since at Temple there is a event hall used for many programs such as Graduation. Looking around my office, I also see a lineup of Disability Studies books from theory to autobiography to poetry. I then glance up on my wall and see my degree, which I earned many years ago. All of this caused me to reflect on the youth with disabilities who are today's graduates. In many ways, their experience of life and their micro and macro worlds are quite different than my generation of peers with disabilities. Certainly this is a great accomplishment for society, but then reality sinks in and I realize that in many ways the youth of today are facing the same challenges of discrimination and stereotypes as we. So what advice can we give a young person with a disability who has dreams and aspirations and may still be innocent of the thorns that may wound the spirit and bruise the ego? Do we tell him or her about the different theories of social repression experienced by those in any minority? Do we speak of making activism a relentless activity that consumes all your energy and concentration? Do we deconstruct for him or her the inequality of privilege and how this nebulous concept is ironically very concrete and palpable in one's daily existence? Should we explain how to be skeptical and wary of employers who may seem receptive but who are just skilled at understanding the Americans With Disabilities Act, and who don't want to be accused of discrimination? And last of all do we espouse the ideals of independence, and how one must do everything at the sacrifice of their own comfort and simple life pleasures to prove their independence? Naturally these rhetorical questions imply a set of values that should be questioned by scholars and other proponents of disability rights and culture. Although the social and political climate in which I grew up in many ways was thought of as progressive and liberating, I am now understanding that many of the ideologies which I osmonically inhaled were variations of the dominant social culture's values and beliefs. I hope that my advice to youth with disabilities might be just a little bit less demanding and a little more empathetic of the totality of their person. I hope that among the words of wisdom I would give is that everyone has their own wisdom inside. That they should spend equal if not more time and energy enjoying themselves and their peers, having fun, being reckless, not being bound to a regiment of goals. Spend the days and evenings exploring life through laughter and yes, through love. Love and be loved. Be empowered by being yourself, by being weak when you feel overwhelmed, and by reaching out when you need others. People who are able-bodied do this all the time. They just don't have it formalized the way people with disabilities are expected to go through a certain procedure of accessing help. My last piece of advice, which probably will make a lot of people within and outside of the disability community wince, is be damned with independence. It is not the measurement of one's value. There is nothing more courageous and genuine than saying, "I am confident and comfortable enough in myself that I know I need you to help me get through or even just be where I am." This looks like such a great summer class I had to pass along the word; go to this website for further information. Sounds like Eugene is the place to be this August! Ida McKinley (born on this date in 1847; portrait above right) was disabled throughout her adulthood--she had epilepsy, and intense headaches, and phlebitis that made it difficult for her to walk. She was probably overmedicated with sedatives. And she had a rough time emotionally--both her daughters died young in the 1870s, and in 1898 her only brother was murdered by his mistress, with an ensuing sensational trial. 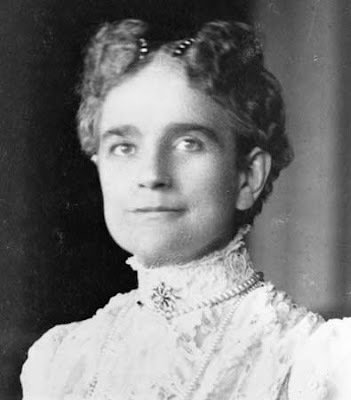 Privately, some in Washington read Ida McKinley as a manipulative "invalid," using her perceived delicacy to demand indulgences (think of Zeena in Ethan Frome for a well-known literary version of this archetype). She would appear at state events propped in a velvet chair, with the understanding that she would neither rise from her seat nor shake hands. She wore luxurious lacy gowns and jewels, to enhance her persona as a fragile beauty. (She was the first First Lady to appear in newsreels, so she had a much wider audience for her fashion choices than previous First Ladies). Ida McKinley crocheted a lot--a fine sickbed tradition; while in the White House she reportedly made 3500 pairs of slippers to raise money for charities. There's some evidence that she was sedated not only for medical necessity but to control her "irrational" personality. Unfortunately, we have little of Ida's own writing to know her experience at the center of all this rumor and spin: her early correspondence with William was burned in a warehouse fire, and the couple used the telephone a great deal in later years. Ida Saxton McKinley didn't write an autobiography, or give any in-depth interviews. And she had no surviving children to recall her. When William was assassinated in 1901, among his last words were concerns about how Ida would learn the news: "My wife--be careful, Cortelyou, how you tell her--oh, be careful." Ida was a widow for six years, living with her sister in their hometown of Canton, Ohio. Her childhood home is now a restored historic site in that town. Nancy L. Herron, "Ida Saxton McKinley: Indomitable Spirit or Autocrat of the Sickbed?" in Molly Meijer Wertheimer, ed., Inventing a Voice: The Rhetoric of American First Ladies of the Twentieth Century (Rowman & Littlefield 2003). Diana Price Herndl, Invalid Women: Figuring Feminine Illness in American Fiction and Literature, 1840-1940 (UNC Press 1993). Michael Chabon, "The Amazing Adventures of Kavalier and Clay"
"You were so heavy to carry," his father said, "I thought you have to be dead. Only also you were so hot against the hand. The doctor came and we put ice on you and when you woke up you couldn't walk anymore. And then when you come back from the hospital I started taking you and I took you around, I carried you and I dragged you and I made you walk. Until your knees were scraped and bruised, I made you walk. Until you cried. First holding on to me, then on to the crutches, then not with crutches. All by yourself." "Jeez," Sammy said. "I mean, huh. Mom never told me any of this." "God is merciful," the Molecule said drily; he didn't believe in God, as his son well knew. "You hated every minute. You just as good hated me." "She always told me you left when I was just a little baby." "I did. But I came back. I am there when you come sick. Then I stay and teach you to help you walk." "And then you left again." The Molecule appeared to choose to ignore this observation. "That's why I try to walk you around so much now," he said. "To make your legs strong." And now whose behavior was out of line? A story today on a morning magazine show brought back such dark, sad memories of my elementary school days. The story talked about a five year old boy who was group castigated by his classmates at the direction of their teacher. Allegedly the teacher required the young student to present himself in front of the class and then requested that his classmates tell him out loud everything they didn't like about him and his behavior. The five year old boy has autistic traits, therefore his behavior was considered unruly. Instead of the teacher creating an environment in which he could integrate his differences with those of his classmates she instead inflicted an unwarranted style of punishment that no child should ever have to endure. Talk about sticks and stones, I have never heard of a more glaring example. In the wisdom of this student he refuses to return to this classroom. This incident reminded me of when I was in the third grade. Due to my cerebral palsy when sneezed I needed help with wiping my nose, my teacher said in a very loud voice "any child that can't wipe her own nose doesn't belong in the third grade." I still feel the warmth in my face as I blushed with severe embarrassment. Fortunately for me my classmates were more mature and empathetic than the teacher. One little boy who I will never forget got out of his seat and helped me with a tissue. We didn't exchange any words, but the understanding was profound and memorable. This happened to me in 1958. Wow, is it literally an emotional whip lash that fifty years later this place of shame for being disabled can be revisited by a young child. The Power Is In The Vote, Don't They Get It? We are rapidly approaching a brand new era in the state of our country. The political tides are about to shift and this, in many people's opinions, is a good thing. A lot of focus, and rightly so, is placed on the Iraq war and return of the veterans. Late at night I listen to the political pundits and the noise around the pending nomination seems to be more around peripheral matters such as whose minister said what. This deflection away from main positions is annoying. I find it equally dismaying that I have never heard the phrase "the disability community vote." It's as if we're a non-existent or at best a politically insignificant constituency. I don't get it. Don't people, particularly the candidates, appreciate or even understand that the issues related to people with disabilities more or less impact on everyone's life? A lot of lip service is given to the return and re-integration into society of the disabled veteran and his or her family. This notion is suspended without any talk of pragmatic plans for greater environmental accessibility and community based support services. The elderly are associated with the singular topic of Social Security and Medicare, but what of long-term living programs and services that will keep people in their families and communities where they belong? I haven't heard one candidate, Republican or Democrat, talk about inclusion of people with disabilities in society as an indisputable right. I wonder if the candidates and their advisors could even articulate the fundamental underlying issues of community-based services and programs. People with disabilities are in the largest growing minority, now numbering 55 million who are identified. The voting block of family, associates and friends, would seem to me to warrant attention if I were running for prez of the most developed country in the world. Hey, that's an idea! Maybe I should run for president! Don't all flood me with emails at once. Sophie Bell Wright fell, hard, when she was three years old. It was 1869, and in her time and place (New Orleans), there wasn't much to be done for the little girl's injured spine and pelvis. The home solution? She was strapped to a chair for the next few years, in the hopes that immobilizing her would bring healing. At age 9, she was able to get around on crutches and wearing a steel brace; for the first time, Sophie attended school. Five years later, Sophie B. Wright (like a lot of 14-year-olds) was tired of being a student. So she opened her own "Day School for Girls," using some discarded benches to furnish a room in her mother's house. By 18, she was renting a larger space to accommodate all her pupils, and she had opened a free night school for (white) daytime workers, too. Sophie Bell Wright worked for temperance, playgrounds, and prison reform, and was president of the New Orleans Women's Club. During a yellow fever epidemic in 1897, she suspended classes and turned her schoolrooms into makeshift infirmary. She published a collection of essays based on her advice to students. In 1903 the Times-Picayune made her the first woman honored with their "Loving Cup" for outstanding social contributions. In 1904, she raised funds to build a home for "crippled orphans" in the city, and later raised funds to expand a specialist hospital. In 1912, a city school was named for her, the first public building in the city named for a woman, shortly before her death from heart disease at age 46. 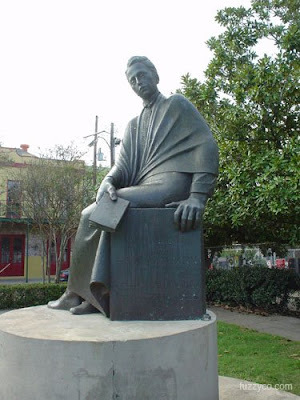 The statue of Wright pictured above was created by Enrique Alferez and erected in 1988, in Sophie B. Wright Park in New Orleans. Her nearby home is also a historic landmark. UPDATE: Obituary in Thursday's Charleston Post and Courier. Thanks to Beth Haller for alerting us to the tribute site to Harriet that has been created by Laura Hershey of Crip Commentary. Elyn Saks, "The Center Cannot Hold"
I read Elyn Saks' The Center Cannot Hold: My Journey Through Madness (Hyperion 2007) for a local disability studies book group recently. Maybe you caught the interview with Saks on radio's "Fresh Air" last summer--a lot of people seem to have, when I mention this book (it's somewhere on my iPod, I think, but I haven't heard it yet). Elyn Saks is a professor at USC's Gould School of Law, and adjunct professor of psychiatry at UC San Diego's School of Medicine. The book is her memoir, beginning in her teens and running through college (at Vanderbilt), grad school (at Oxford, on fellowship), law school (Yale), getting tenured at USC and getting married and surviving cancer twice. But through all of that, her story is about having schizophrenia--not triumphing over it, not recovering from it, but living with it, through stresses and moves and career milestones. It's engaging and sometimes funny and sometimes harrowing, especially when comparing her treatment in the UK and US. If you liked Amy S. Wilensky's Passing for Normal: A Memoir of Compulsion (Broadway Books 2000), you'll probably find this well worth checking out, too. What makes life wonderful--good friends, a satisfying job, loving relationships--is just as valuable for those of us who struggle with schizophrenia as for anyone else. If you are a person with mental illness, the challenge is to find the life that's right for you. But in truth, isn't that the challenge for all of us, mentally ill or not? My good fortune is not that I've recovered from mental illness. I have not, nor will I ever. My good fortune lies in having found my life. One problem with blogs is that comments are usually hidden from the front page of the board. In order to foster conversations and to give people a place to ask questions, I have started a chat board on HIV/AIDS, Deafness and Disability, all are welcome. This past weekend I attended a transgender health conference mainly to hear a presentation by Eli Clare, famous disability and transgender activist and author. While I was sitting in the audience, I felt such a sense of camaraderie and acceptance of just being a person. I listened to Clare's thoughts as he passionately and poignantly discussed the process of appreciating the pain and plight of having one's identity stolen; then the parallel process of reclaiming that identity. Clare talked about how disability is socially in the mix but it was almost as if he didn't have to articulate the notion of disability because image identity is so synonymous with any kind of dissonance that society creates between what is acceptable and what is not, and the assumed privileges assigned to the former. Although I was really impressed by Eli Clare's lecture and his interaction with the audience, what was even more significant to me that I took away from the conference is the emotional affirmation and intimacy that the transgender community showed for each other. At one point, I found myself feeling at a disadvantage or cheated because in the so-called "straight" community, there is not the sense of empathetic bonding, only a sense of assumed privilege that not all of us share equally. I don't mean to be overly critical of my heterosexuality. Sometimes what is considered dominant and mainstream can be compared to a morass of conflict and complications. Maybe I'm idealizing other sexual identity communities but it seems to me that the straight community, as far as I know, is embedded with archaic stereotypes and fantastical media-driven social roles. As a straight person, I feel as though I don't have the same type or level of understanding, acceptance, or empathy from women or men in this community. Regardless of gender identity or sexual orientation I think that many important lessons can be learned from other minority communities as far as support and intimate rapport. They taught some of the history of chess and rap-like chants, some of them in Spanish, to remember how to set up the board, what each piece can do, all that. It's hard to see, but they brought a large-scale chess set for demonstrating--each piece is about the same height as a seated child, but light enough for a child to lift or push into place; and a hanging banner showing the chessboard, with clear pockets for moving the pieces (on cards) around. They did a nice job with making chess interesting, using various media and models, to meet a very diverse group of kids wherever they were.